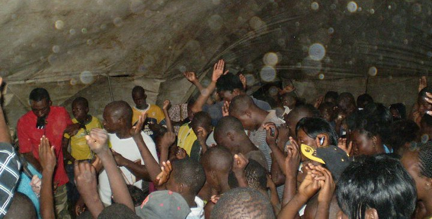 Missions trips involving Trumpets of Zion. Vince and I were honored to take part in a mission trip to South Africa with our church Atlanta Revival Center and pastor Vance Murphy. 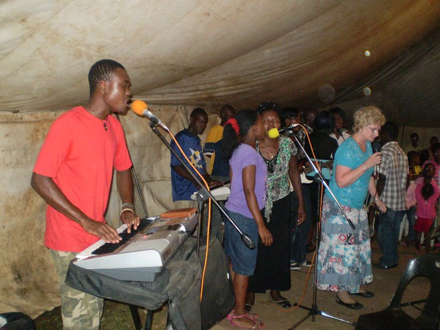 We ministered every evening for a week in a tent church in the area of Tonga located about 10k from Mozambique border, and 15k north of the Swaziland border. Every service was unique and each night God allowed us to experience the fire and glory of God. We saw hundreds of people come to Christ for salvation. Many were delivered and healed in body and soul. Many were encouraged in the Lord. The darkness of witchcraft was pushed back in the area as the power of the Kingdom of God was released. The pure and simple gospel of Jesus Christ preached always releases the power of the God. We believe for the fire of God to remain with them so much more can be done to the Father’s praise and glory. We visited the children’s home of IRIS ministries, praying and encouraging them. We also attended a children’s feeding center near-by and was able to assist in their Christmas Party. We saw 400 eat with only enough food for 200. This is not unusual for them to experience. Little ones lined up with their little bowls to get a small portion of rice. They are so amazing to see the joy on their faces and in their hearts because of the love of Jesus they experience. We were blessed to be a part of the personal ministry among our group and develop closer relationships with the church body. One particular Morning Prayer meeting was charged with the power and presence of God among the group. It also directly affected the tent meeting that evening with great victories in taking ground for God in the Tonga area and in the personal lives of the people. Finally, a first time perk for us was a day tour through Krueger Park, the world’s largest natural habitat animal reserve. It was amazing that we saw everything except the cheetah up close and personal. One pride of Lions were about 100 feet from our vehicle and even a huge rhino so close we could see his eyes. The whole experience was a special gift from God. We love Africa and cry out for this continent to become a force of God’s light on the earth. Africa will light the world as it burns with the fire of God’s love. This entry was posted in Missions on January 16, 2011 by Janee Hawks. 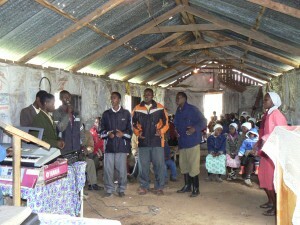 God is moving in Kenya and all over the world. We are so grateful and blessed for the opportunity to recently minister the gospel of the Kingdom in Kenya. The church is in an awakening of a reformation that will bring the coming of the Lord to the earth. Believers everywhere are coming out of many dead traditions man has made in the church age and into the Kingdom Age. God has destined the body of Christ to infiltrate His Kingdom into every kingdom of this world. The church all over the world is breaking out of the cocoon of yesterday . Transformation by the Spirit of the Lord is giving the church a whole new face , a new heart with the freedom to become a real testimony of Jesus Christ. The capacity to hold what the Lord Jesus Christ is doing in lives on the earth today requires a fresh baptism of the fire of God and a heart surrendered to receive an indestructible new wine skin. Holy Spirit is pouring into the bride of Christ new wine for this age of the Fathers love and joy, with unstoppable faith and an abiding glory. Vince and I were able to fellowship, pray , prophesy and minister to groups of leaders and believers in several churches. We shared the truth of the heart of the Kingdom which brought the power of transformation to many. Repentance is such gift of love from God and many leaders and believers received gifts from Holy Spirit, fresh vision and anointing.We prayed for the sick and for the little children laying hands of all of them. God was faithful to encourage , to set some free, to bring healing in many areas, and to confirm His word with some supernatural sign everywhere we ministered. We planted seeds of purpose where God spoke to give and God will give an increase .We have testimony from some of the pastors that are seeing the Lord’s fruit from this trip. We thank God for nothing is accomplished by our human efforts or ability but only “by the Spirit of the Lord. “We give all the glory to God for He alone is worthy” Vince and Janee Hawks In Jesus mighty name may the faith of Kenya be in the power of God not in any wisdom or efforts of man. May they know the fear of the Lord that will bring great favor on the bride of Christ in Africa. And may Africa stay on its knees before the one true God until fire and glory sweeps across this great continent and spreads to other nations. CHILDREN IN CIRCLE WANT HOLY SPIRIT TOO! This entry was posted in Missions on June 18, 2010 by Janee Hawks. Trumpets of Zion Ministry has completed the second trip to Africa. Vince and Janee Hawks spent most of February in and around the areas of Kisumu, Kenya and some near Soroti, Uganda ministering in churches, a pastor's conference and leadership training. 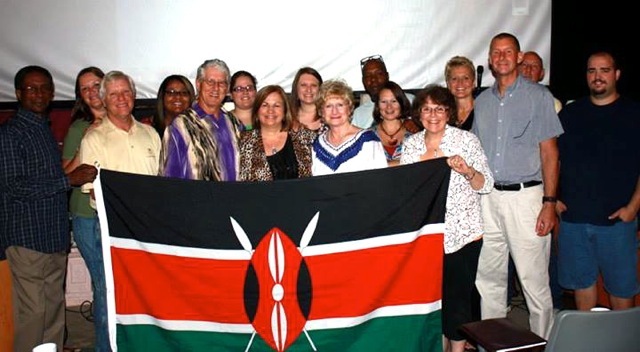 TOZ was registered in Kenya as Trumpets of Zion International with a board of Directors representing the ministry there and the one here in USA. We planted the first church, TOZ Community Church of Buyangu. They have already filled the 50 chairs we purchased and are in need of more. Land and a 10-year tent are also being purchased. The growth will accelerate rapidly as the spiritual hunger for the gospel of the Kingdom of Jesus Christ is very great. We visited in the villages, spend some time in homes, built many relationships with leaders, and touched many children who are without parents and homes. At our meetings not once but daily we witnessed a miracle of food multiplying for the needs those who came to eat. It was such a blessing to spend one day in ministry to a group of women, all from different churches in the area. They come together once a month to pray for their families, their churches, and their country. God was so pleased with this unity and poured out His Spirit on them. One of the special times of this trip was ministering at a pastor's conference of 250 pastors, plus women and children in Otuboi, near Soroti, Uganda, the pearl of Africa. Here the needs are so great but the hunger was incredible. It was a great time as we were overshadowed with a powerful anointing of God, and much was accomplished to edify, exhort and comfort the body of Christ there. Again we witnessed the miracle of food multiplying because of so many who came to eat. We have also launched a TOZ leaders training school beginning with 20 Pastors of the Kisumu area who will be completing the world-renowned Bethel Intensive Program. Some of these 20 pastors already have churches of 50 to100 members. The potential of multiplication is great as we answer the Lord's call to "Go make disciples" and to "Go train leaders who will equip the whole body as laborers for ministry to reach this last harvest of the earth." The harvest is great but the laborers are few. The apostolic goal is to build the Kingdom of God on the earth from the vision God gives as He enables by His Spirit. While that does include churches, training centers, buildings and such, those are only the tools. The real heart and power of the Kingdom of God is only found within the spiritual quality of God-life in His people. Therefore our first priority is to build lives transformed into His likeness, abandoned lives where God can come and make His home; lives through which God can move to turn injustice to justice in this world. The pure simple gospel of Jesus Christ is the power of God imparted into minds and hearts of people by the Spirit of the Lord and it amazes me that it will go anywhere in the world to any race, any age, any culture, any time to transform lives. Would you consider helping us with this mission? God has given us this task, we are called to it; therefore we know God will speak to some of you to help us financially do the work of His heart in Africa. We are so blessed in America; we must be a blessing to others. It is easy for us to understand this burden because we have been there to feel and see the overwhelming hunger and need. However, for you it will take sincerely asking God to speak to you about whether you are to be among the ones who help make this happen through supporting us regularly or even one time. Please just ask Him. This entry was posted in Missions on March 11, 2007 by Janee Hawks. Trumpets of Zion (TOZ) has been raised up as a discipleship mission with a vision to become an equipping center for the Kingdom of God. We believe that God wants us to empower the body of Christ to maturity for the work of ministry wherever He leads us. We have a mandate to prepare the way of the Lord. Recently in November of 2006 God called us to go to Kenya to do leadership training in some villages and churches around Kisumu Kenya. 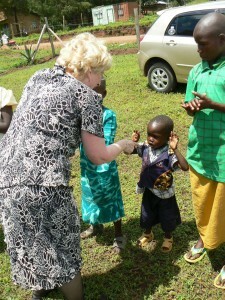 We were able to spend time in their culture and minister to women and children as well. God moved mightily through His word and Spirit, starting a move of hunger and thirst for more of His presence and power. We saw many changed and filled with the Holy Spirit. TOZ was asked by a group of 20 Kenyan pastors to start a ministry center there in Kisumu. We are currently in the process of registering TOZ in Kenya, and transferring a land deed for a future center. We believe this will be a long-term Kingdom relationship and ministry reaching as far into the spiritual and natural needs of Africa as God will mandate. We went into Uganda to intercede for the work of the Kingdom of God there and plan to return to minister. We have formed a TOZ fellowship board of 20 leaders with Peter Onyango as the overseer of this ministry in Kenya. We met Peter here in USA seven months ago. 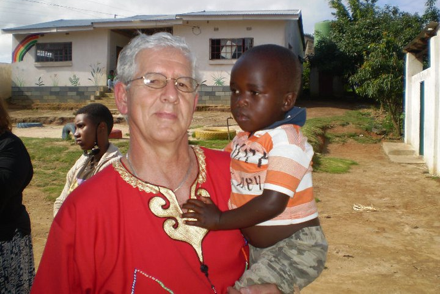 Peter is well educated and has been called into the work of an apostle for Kenya. He is gifted with much wisdom and leadership skills. In the month of February of 2007 Vince and Janee will be returning to begin the first step of training with the 20 pastors. TOZ is a member of the world-renowned Bethel Series Program and we have 10 years experience teaching this course. Vince and Janee will do a training clinic to equip Peter to finish the course. We will also do leadership training in hearing the voice of God, understanding the language of the Holy Spirit and living the biblical prophetic from the secret place. The vision is to see the set up of TOZ Kenya for a Kingdom ministry center where prayer, worship and discipleship will be constant and where many will be sent out to various callings empowered by the Holy Spirit. We also see this ministry planting new churches, other missions and reaching out to the poor, the orphans and the widows. God has instructed us now to build a missionary support system. We have stepped out in faith , especially financially, in obedience to the Holy Spirit . 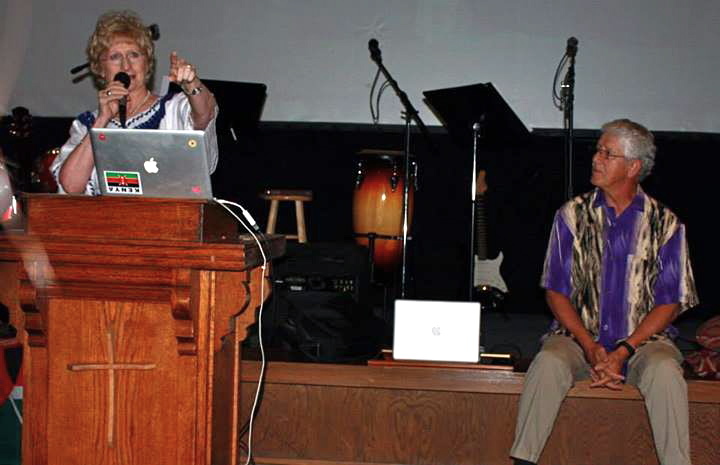 Vince and Janee Hawks are the vision bearers for TOZ. The body of TOZ is a small group of leaders who understand the calling to be the vision carriers. 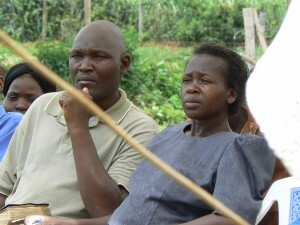 We believe God for a base of vision supporters for this work in Kenya. Would you please consider us as a prayer support and if God touches your heart to be a financial support (tax deductible) to this vision, please let us know. Our prayer is for God’s will to be done and His Kingdom to come on the earth as it is in heaven. May the grace and peace of Jesus Christ fill you. This entry was posted in Missions on December 20, 2006 by Janee Hawks. Janee, Tim and Suzanne traveled to Kenya November 5-15 2006. We arrived in Nairobi for one night stay and traveled a rugged 8-hour bus trip to Kisumu, Kenya to meet our guide, Apostle Peter Onyango and his family. The bus trip with all it included shook America out of us real quick. 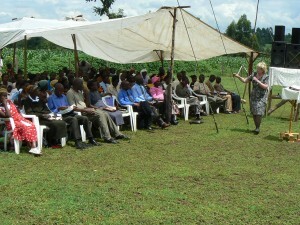 We spent most of the days ministering and teaching Pastors and leaders from around the Kisumu area. God met us in a real glorious way. We had a day of ministering to several of the women of the area. It was a precious and intimate time with them. 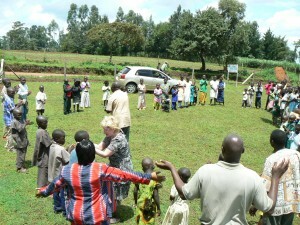 We also had some times to teach many children including orphans. We were able to feed a good meal to a bunch of orphans. We went to schools to pray with the head masters, teachers and over the schools. We went to the village jail and ministered, seeing 3 of the police officers saved. We also drove across the Uganda border to pray and intercede for a much needed move of God. We planned to do a conference at the mission there on the next trip. God was faithful to us through the battles and the fast pace. God moved mightily with anointing to preach the gospel to the poor, to see Him heal the broken hearted, set the captives free, set at liberty the bruised, open blind spiritual eyes and ears. 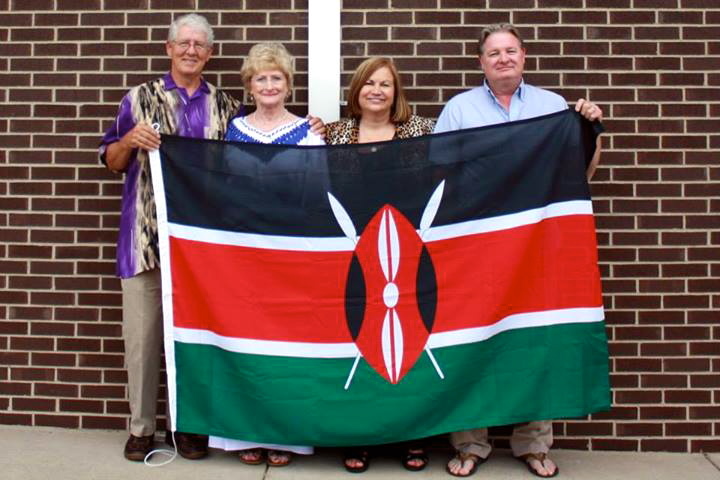 We were awed and overwhelmed at the love of God for the people and from the people of Kenya. It was a special blessing to be a part of the families and culture there and to feel that because of Christ through us some were saved, and the church was blessed and refreshed. We believe God started a move of His presence there, some experienced the fire of God and many tasted the goodness of the Lord. We give our great and mighty God who is "The Faithful One" all the praise and glory for lasting fruit in the Kingdom of God in Kenya. We also look forward to more opportunities to do the will of God in Kenya in the near future. This entry was posted in Missions on November 21, 2006 by Janee Hawks. Four of Trumpets of Zion staff members have been to Mozambique, Africa on three separate mission trips over the past three years. Working with Rolland and Heidi Baker’s Iris Ministries, Tim Pugh, Samuel Clough, Mark and Jennifer Mozley, have had the honor of being a part of a revival that is unprecedented in church history. In fact, Mark & Jennifer actually got engaged in Mozambique in 2002 with Heidi Baker marrying them the following year. Staying at an orphanage of 500 children, the teams would participate in various outreach events including pastor’s conferences, street preaching, praying for the sick in hospitals, plus jail and refugee camp ministry. They participated in church plantings in Pemba, Mozambique where they saw Jesus save 100’s of Muslims in a single outreach. And yet perhaps the greatest privilege was simply hanging out in the dirt and playing with the children. “Stopping for the one” person was imparted into all of their hearts on these trips and we’ve seen the fruit of these missions back in the states…as the team continues to reach the lost and dying through various evangelistic events in Georgia. This entry was posted in Missions on August 4, 2006 by Samuel Clough. 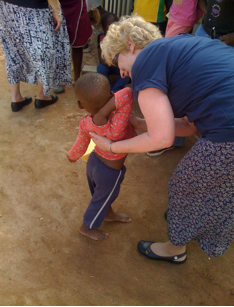 TOZ leaders Mark and Jennifer Mozley are currently in Mozambique Africa. This is their third mission trip to this area serving with Heidi and Rolland’s ministry Iris Ministries. Please keep them in their prayers as this is a demanding environment for missions, especially during this summer period when the temperatures are especially hot. Also watch our news for a full update when they return from their trip. This entry was posted in Missions on January 1, 2006 by Janee Hawks. Trumpets of Zion sponsored a mission trip to India for two of it’s members, Mark and Jennifer Mozley, in July 2005. They ministered to hundreds of Indian leaders in two pastor’s conferences as well as numerous outreach events. It was refreshing to see the humility, hunger and passion of the India pastors who suffer from intense persecution in a culture dominated by the Hindu and Islam faiths. They witnessed the salvation of dozens of people during various outreach events throughout the trip. They were particularly touched during their visit to an Indian leper colony…where the love of God flowed freely. During the last leg of their trip, they stayed at an orphanage and fell in love with the precious children their families had rejected. Revival is breaking out all over India and it was their privilege to see what made this region such a hotbed of God’s tangible outpouring of His Spirit. It was evident by their emphasis on prayer, fasting and attention to discipleship and evangelism, that the India people captured His heart. In these and many other ways, the trip confirmed that Trumpets of Zion is on the right track with their ministry focus. As it has been since the great commission came from our Savior’s lips, it’s still all about loving God and loving people. This entry was posted in Missions on August 1, 2005 by Janee Hawks.